Tonight Meg had a double header. That means we don't get a good dinner. We have to sit on hard bleachers for a few hours. We have to find a way to keep the Reds happy. And the later is not always easy to do. We try to make them wait for the third inning before making a trip to the "confession" stand. Sometimes Mattey really gets into the games and will ask what's going on and cheer for Meg's team. Sometimes...not. Kade usually wanders around or digs in someone's purse, usually it belongs to someone he knows. Their most favorite activity while at the ball park is play in the dirt. I've probably posted about this before but it was something that happened today and they played so well together I wanted to document it. They like to use rocks and sticks to make rivers or streets. 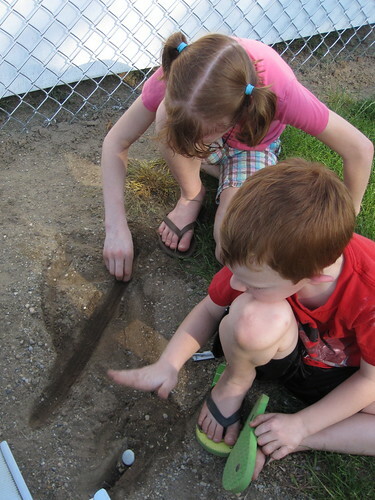 Usually they have some kind of imaginative play thing going on with all the dirt. They are really good at that. Meg won both games. (I didn't post about it on Friday but she's been out of the boot since then. I need to go back and add a few things to that day.) She got to play a few different positions, first base, center field, and short stop. She also got a double. When we got home Mickey wanted to try out the sprinkler system. He came in soaked. I think he had a little too much fun trying them out.